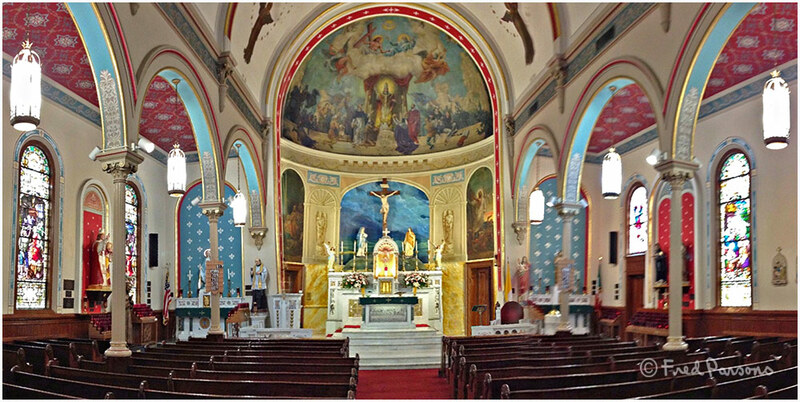 St. Leo's Church is a historic Roman Catholic church complex located at Baltimore, Maryland, United States. It was built in 1880-81 of brick with stone trim, and combines Italianate, Romanesque, and Classical elements. It features a high entrance porch, a turret with conical roof on the north wall, a square bell tower at the northeast corner, a large rose window in the main façade, and a variety of decorative brickwork. It was the first church in Maryland, and among the first in the nation, founded and built specifically for Italian immigrants. The church was designed by Baltimore architect E. Francis Baldwin. St. Leo's Church was listed on the National Register of Historic Places in 1983. Great wide angle pano with excellent details of the interior. V.